Complete Quick Install Ready Strut Assembly Set. Pre-assembled and ready to install! Set includes Both Front Driver and Passenger Side Ready Struts. Each Assembly includes: Strut Coil Spring Boot. 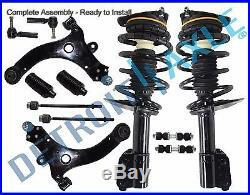 2x Front Quick Ready Strut Assemblies - 171661. 1x Front Lower Driver Side Control Arm + Ball Joint - K620675 interchage (K80539). 1x Front Lower Passenger Side Control Arm + Ball Joint - K620676 interchange (K80538). 2x Front Sway Bar End Links - K5342. 2x Front Outer Tie Rod End Links - ES3459. 2x Front Inner Tie Rod End Links - EV195. 2x Rack and Pinion Boots with Bellows - BT 26078815. Excludes Police & Taxi Packages. For Models with 16 Wheels Only. Not what you were looking for? To find the right part! Detroit Axle offers parts and accessories for the perfect combination of quality and value. Detroit Axle offers cost-conscious customers a full range of parts to a broad range of application. Provides extensive coverage of bearings for a broad range of automotive and heavy-duty 4x4 wheel applications. Manufactured in ISO 9000 / ISO 9001 / ISO 9002 certified facilities gives the fit, performance Reliability and durability of OE. Detroit Axle offers an extensive lineup of Wheel Bearings, CV Axles, Power & Manual Steering Rack & Pinions, Gear Boxes, Ready Struts, Drive Shafts, Prop Shafts and much more. Detroit Axle offers an extensive coverage of bearings for a large range of automotive and heavy-duty wheel end applications. Our Products are manufactured in ISO 9000 / 9001 / 9002 certified facilities. Detroit Axle products delivers the look, feel, fit and performance of OE. Manufactured with Internal bearing seals that are specifically designed to combat all types of road conditions to keep debris out and keep the bearing turning. The item "Complete 12pc Front Suspension Kit + Both (2) Front Strut Assembly for GM Models" is in sale since Tuesday, November 17, 2015. This item is in the category "eBay Motors\Parts & Accessories\Car & Truck Parts\Suspension & Steering\Shocks & Struts". The seller is "detroitaxle" and is located in Detroit, Michigan. This item can be shipped to United States. Additional Notes: Pre-assembled unit makes for quick strut assembly!